The Franklin Technology Department exists to enhance, enable and empower engaged learning with the tools of technology. A new program at Franklin High School will allow FHS students to graduate with both a high school diploma and one year of a Bachelor of Science degree in Information Technology. Students who successfully complete the coursework will earn priority acceptance to either the University of Cincinnati or Sinclair Community College in the Information Technology program, where they'll enter as second-year students. This Early College Information Technology Pathway is the result of a new partnership among Franklin High School, Warren County Career Center, Sinclair Community College, and University of Cincinnati. 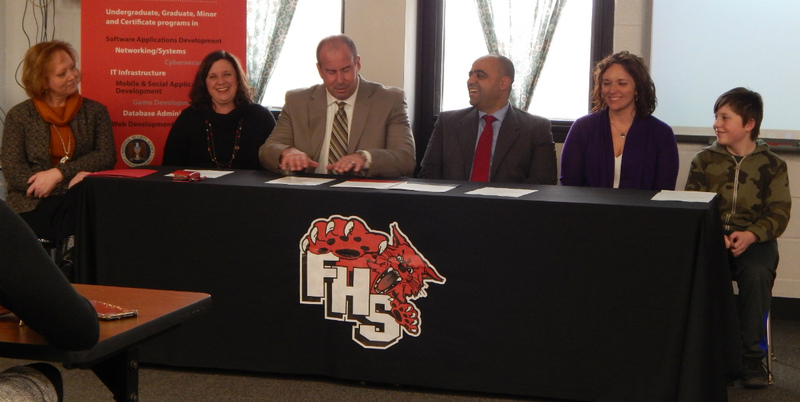 The agreement was formally signed at a ceremony at Franklin High School on March 7. Students would benefit financially by graduating from high school with one year of college at no cost to them, then continuing their education at either Sinclair's tuition rates and scholarships, or the chance to earn money while co-oping through UC. FHS principal Kelli Fromm said the program will be marketed to current and incoming freshman and that she expects 50 to 60 students will sign up the first year. In 2018-19, FHS will share an instructor with Waynesville High School. She added that the goal is to build enough student enrollment to support a full-time teacher at FHS in the second year. The instructor is hired through the Warren County Career Center. Over their four-year high school career, FHS students would take three academic and seven IT classes that together comprise the first year of of the BS degree. Academic classes must be College Credit Plus or AP classes and the seven IT classes include Introduction to IT, Introduction to Computer Programming, Programming II, Introduction to Networking, Database Applications, Web Design (HTML/CSS), and Networking II. Upon graduation, students could enter Sinclair Community College as a second-year student on a pathway to earn an Associate's degree in IT one year after graduation. Alternatively, students could enroll at University of Cincinnati (UC) as a second-year student. Enrolling at UC would allow students to participate in UC's co-op program. Continuing with the programs, students could earn a Bachelor's Degree in IT three years after graduation and a Master's in four. Dr. Hazem Said, Head of the University of Cincinnati's College of Education, Criminal Justice, & Human Services School of Information Technology, complimented both Franklin City Schools and the Career Center for their creativity and leadership in adopting the program, noting that a number of other districts had the opportunity to pursue it but did not. Jesse Ferguson, a current FHS freshman who plans to enroll in the program, said that the best part for him is being able to get his Bachelor's degree in three years. The collaboration among the entities is another example of the district's commitment to increasing technology for students. Educational Technologist, Amy Hudson Estepp, spoke about some of the other programs in the lower grade levels that will drive student enrollment for the program. Specifics mentioned were junior high school coding and STEM courses as well as upcoming elementary robotics and gaming clubs.